An Interview with "The Science Guy"
School can be a confusing time for many adolescents. While teachers spout out specific terminology, lessons, and why you must pay attention in class if you have any hopes of a bright future, some kids are thinking about everything outside of the classroom. They think about how nice it is outside, how the other gender has cooties, and, when they get a little older, the other gender and the sudden absence of said cooties. It takes a special teacher to help guide a student and get them to learn, but what does that person look like? For some, it could be that cool English professor or that stern, yet kind principal. For many people that grew up in the '90s, however, they think of a thin man in a bow tie and blue lab coat. You see, Bill Nye showed kids that science was, in fact, cool. The man lovingly known as 'The Science Guy" taught a whole generation of pre-teens, teens, their parents, and other adults about a variety of topics on his multi-Emmy-winning program Bill Nye the Science Guy, with lessons ranging from flight in the first episode to motion in the last. It's been over 15 years since the final installment of Bill Nye the Science Guy, but that doesn't mean that his fans have stopped learning from him. 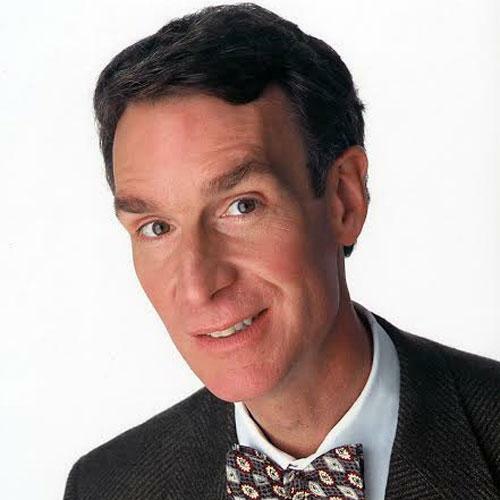 Since the show ended in 1998, Nye has worked with the Mars Exploration Rover, held the position of vice president of The Planetary Society, written several books, hosted the award-winning show 100 Greatest Discoveries on The Science Channel, and has become a vocal opponent to creationism. Still, there's more to Nye than just science, guys. Fans of ABC's popular Dancing with the Stars saw the former Boeing engineer's moves for three episodes before he was eliminated. Nye also used to perform stand-up comedy before he became a sensation on PBS. Now, he's continuing to perform, as he'll be in Erie to speak about the importance the current generation of students have on the future at the Junker Center at Penn State Erie, The Behrend College at 7:30 p.m., Wednesday, Jan. 29. I got a chance to chat with The Science Guy himself about the talk, his beef with creationism, and how an injury derailed his chance to be a dancing star. Alex Bieler: Have you ever been to Erie before? Bill Nye: Yeah, I was there many years ago. You guys used to have a city walk on New Year's Eve, but you don't do it anymore. A dear friend of mine from high school lives in Cleveland, so I go to Cleveland often enough. AB: Alright, I'm originally from Cleveland. BN: He's lives in Shaker Heights, so you can imagine. AB: I'm from the west side, but I know exactly where that is. Got some good delis out there. BN: That's not the only reason he lives there, but it's certainly a factor. AB: I was reading up on the event announcement for your upcoming show, and it says that you'll be talking about you career and some other topics. What kind of show would you say it will be like? BN: Well, the word "show" is fine, but let's call it a talk or a lecture or an insightful hour-and-a-half that will change the course of human history. No wait… it's me talking about how the students of Penn State are going to, dare I say it, change the world. I mean, how hard could it be? AB: Are you going to be going over your own career and tell them what they can do? BN: No, I'm not going to talk much about my own career. I anticipate talking a little bit about Mars. I was briefly involved… well, I'm still involved… in the Mars team. I do a little bit of work with NASA that way. AB: You were involved with the MarsDial, right? BN: Yeah, the MarsDial was my thing. There are three of them up there now. Although the Spirit Rover is not operating, I'll bet you the sundial is still casting a shadow. AB: So what are you going to be telling students to inspire them? BN: I will point out that technology is advancing at an extraordinary rate. Climate change is a very serious, a very serious concern and this is going to be the generation to have to deal with it, so I want you guys to get out there and change the world. AB: Given that there are people that doubt global warming and see science as an opinion, what do think of the status of science in America right now? BN: It's extraordinary and very bad. In other words, there are some parts of our society that are doing extraordinary things like operating cars on another planet. There is no other space agency or administration in the world that can do that. But at the same time, I'm going to be debating a guy in Kentucky who apparently, as far as I can tell, really believes that the Earth is 6,000 years old. He's not kidding. AB: Is that Ken Ham (President of Answers in Creationism and the Creation Museum)? AB: That debate is actually happening less than a week after the Behrend talk. BN: It's the 4th of February, yeah. AB: I remember reading that there was a group [the Richard Dawkins Foundation] that was saying that you shouldn't even be debating him. BN: Oh yeah, a lot people have said that. AB: So why do you feel the need to debate him? BN: Well, I was very critical of creationism in a thing that was posted by an organization called Big Think. Mr. Ham was very concerned about it, so he approached my office and wrote several letters, and I eventually said okay. Full disclosure: Ken Ham is paying me to come debate him. BN: Oh yeah. Furthermore, I plan to donate that money to causes that are pro-science. He knew this and this is his thing. It works both ways; he gets to raise a great deal of awareness for his position and the apparent beliefs about creationism. I look forward to the day when his views are completely discredited and no schoolchildren are subjected to them, except subjected to them only in historical context, but that could be a long way off. It's mano y mano, it's guy vs. guy here. So I'm calling it, and people love this, the Ken Ham Creation Model, the KHCM. The question I'm debating, and I emphasize this to people, is: is such a model viable in science or in human thought? Is it useful? Does it make predictions? Is it a reasonable accounting of the past? To me, no, no, no. But this makes his world go round. AB: On a bit of a less serious note, I saw that before you were on PBS, you did a couple of shows up in Seattle and that you were known as the Speedwalker. BN: Oh yeah, yeah. Speedwalker was a lot like me, I admit. AB: Did you ever think that if the whole Science Guy thing didn't work out, that you could have been the Speedwalker instead. BN: Well, Speedwalker… first of all, I'd like to emphasize to anybody not familiar with it, is that he's a fictional character. Also, he would be then, if someone would pursue that professionally, one would become a professional athlete, and your speed walking days, at least a t a competitive level, would be numbered. That aside, I think the more valuable assessment of Speedwalker was it was a comedy bit, one of the several of my repertoire as a performer [laughs]. AB: Yeah, you used to do stand-up comedy for a while, didn't you? BN: Oh yeah. I dabbled. I middled for a little while. I don't know how much you know about stand-up comedy, but there's an emcee, a middle act, and a headliner. I was a middle act for a while, rightfully. I never headlined, I never made it to the bigs. AB: It ended up working out okay. You had that little show on PBS for five years. BN: That was a little more my thing, that little show. AB: I was thinking about how it's been over 14 years since Bill Nye the Science Guy ended and people are still obsessed with it. BN: I love those people. It's still shown in schools a great deal. When I go to the science teacher convention, the NSTA, the National Science Teachers Association, I'm this extraordinary individual, a little rock star-ish. AB: How does it feel that these children that watched the show back then are now growing up to be some of the decision makers in society? BN: I think it's fantastic. It's a life's dream. As I say all of the time, I think we need another decade, because people come up to me all of the time – and it's extraordinary, Alex, absolutely extraordinary – people come up to me and say, "the reason I became a physician" or "the reason I'm a chemical engineer is because I used to watch your show," and that's very gratifying. But I'm still interested to see if somebody with this predisposition for science or this same love for science that I have comes up with a cure for cancer or comes up with a battery that changes the world and reduces carbon emissions and saves an enormous number of humans from miserable lives in climate change because he or she developed this new way to store electricity. Not to put any pressure on my fans, but… It's really something else, man. It's people of all ages. I live in Los Angeles and there are a lot of real celebrities around, but people are sure nice to me. I'm a kids' show host and people have their picture taken with me all of the time. It's a real surprising thing. AB: A couple of people in the past week have asked me what I was working on and every time I mentioned that I might be interviewing you, people's faces would just light up after hearing it. One person even said to me that you can't just say "Bill Nye," you have to say "Bill Bye The Science Guy." BN: It's all one word, yeah. AB: Do you ever get tired of "The Science Guy" title, or is it just an honor? BN: It's great. You don't even have to hyphenate it anymore, it's all one word. It's a good problem to have. AB: Do you know about the British actor Bill Nighy? BN: Oh yeah. People think I'll have a new movie out and that I'm extraordinarily wealthy. It's great. He was in a couple of the Pirates of the Caribbean movies. Davy Jones. No, that hasn't been a big problem. It's charming that people think I have a new movie out. The other thing that's changed is that people think I'm dead because of The Onion article that was published several years ago. AB: There were a couple of them. I think there was one called "Crack Nearly Killed Me." BN: Yeah, but there's no story. It's on page 40-something, but there's no such page. It's interesting to see that people even now have limited critical thinking skills even when it's in a satirical publication. But it's nice. I wrote The Onion to thank them for killing me. AB: That's probably a letter you never expect to write. AB: My girlfriend is a fan of Dancing with the Stars, so she would be mad at me if I didn't ask about that. BN: It was the coolest thing. It was just cool. AB: Did they ask you to be on the show or did you contact them? BN: Eventually they did, but my claim or belief is that I had asked my agents to ask them for quite awhile. It got to the point where I often wondered if my agent, my publicist was just telling me "oh yeah, I called them, I did that." I thought they were so sick of me asking about it, but eventually they did contact me last July or so. Maybe it was August. AB: You're a big swing dancer, from what I've read. BN: Yeah, I go swing dancing quite a bit. It turns out, you know that expression "your strength is your weakness, your asset is your liability." I didn't get to the point where it was especially useful. The injury [a torn quadriceps tendon suffered in the second episode] was really [bad]… In fact, the reason I spaced on calling you was I was just working out and my trainer had asked me to do another 10 minutes on the bike. I did, because he's very diligent about this. I'm doing big leg-strengthening exercises to get my left leg back and he noticed that I was getting stronger, so I did more and I forgot to call you, and I apologize. AB: That's fine, it's understandable. BN: So my leg is coming back. It's only been in the last week that, three-and-a-half months into this [injury], that I could run at all, let alone at any reasonable speed. It was a really serious injury. AB: I know that you danced to "Get Lucky" by Daft Punk on the show. Did you pick that song or did producers pick it? BN: They picked it. I love that song, frankly. AB: I was wondering if you were a big fan of theirs. BN: I like it; yeah I really like that song. They picked it and there was a lot of encouragement, let's not take it all of the way to pressure, to do that sort of shtick, that science shtick, and I was anticipating letting the producers, if I may, get it out of their system, so that I could really compete and really try to be a better dancer than the other people, but I had injured myself so seriously that I couldn't do it. Have you ever got a knitting needle red hot and stuck it in your thigh? AB: No, can't say that I have. BN: I've never done that either, but I have a sense of what that would be like. AB: Well, that sounds unpleasant. I was wondering about the music because on Bill Nye the Science Guy you would always do the music parodies, so I wasn't sure if you were just a buff or anything like that. BN: Well, full disclosure, I listen to "20 on 20" on Sirius Radio, that's where I listen to contemporary music. I still listen to, we have a really popular radio station out here, AMP Radio, which you can listen to online, but I mostly listen to satellite radio now. Full disclosure, one of the guys on the board of The Planetary Society was one of the inventors of XM Radio. AB: I remember when that came out. My dad had a subscription and we would drive around and listen to it. BN: Oh yeah. Any modern car nowadays has it on board. So I'm speaking to you from the cabin, the cockpit of my Nissan LEAF all-electric vehicle. AB: Oh really? You're coming over the phone nicely. BN: Yeah, you see how quiet it is? If you have an electric car, you don't want to go back. AB: I never would have guessed that you were in the car. BN: That's very nice. So many people say that. The car is well enough insulated acoustically, but it's so much quieter to start with. It's an electric motor running through just a couple of gears. It's not a big transmission. You don't have explosions going off right in front of you. AB: Do you have anything you'd like to tell the people of Erie before your talk? BN: I'm looking forward to it. I'm very much looking forward to seeing the Penn State crowd. Penn State overall should be very proud because Michael Mann's editorial about climate change was published in The New York Times. AB: Excellent. Thank you very much, good sir. AB: I'll see you when you come to Erie. BN: I'll see you in, what is it, just about two weeks? AB: Let's see, that about nine days I think. AB: Thanks, you have a good day. BN: Carry on, thank you. Alex Bieler can be contacted at aBieler@ErieReader.com, and you can follow him on Twitter @Catch20Q, where he posts things about music and the occasional fluffy, adorable animal.